What do you do when your kids are not listening to you? Most parents keep repeating themselves, or try somehow to coax them into getting their child/teen to do what they told them to do. Our question for you is why are you talking to a child that is not listening to you or does not want to hear what you are saying? Most parents think they can talk their kids into paying attention to them through their great oratory skills but it rarely works. The more talking you do the more your child’s mind is traveling somewhere else. If your child finally gives in it is to get you to go away or get off his back. What kind of attitude will he/she have while getting the task done if he was coerced into it? It doesn’t matter if his wrong attitude is because he is mad, sad, lonely or another reason. It is still a wrong attitude. We find parents all too often correct for the wrong action and remind for the wrong attitude because the task got done and parents are satisfied with that. Do you get away with wrong attitudes at your place of employment? Then it shouldn’t be allowed at home either. Your home is the training ground for your child being a good employee someday. We learned a long time ago our kids attitude drove their actions (8 years and up), and we needed to focus on their wrong attitude and we would get the right action. We had to continually remind ourselves that two of the four characteristics of obedience we learned about in the Growing Kids God’s Way parenting class have to do with attitude. So why did we and why do most other parents let their kids with wrong/bad attitudes off the hook? Wrong attitudes show in the looks your kids give you, their body language and in the tone of their voice. You need to learn what your kids’ body language is telling you. Look at the pictures at the top of this blog. The first girl has the Phlegmatic temperament and you can see her attitude on her face, but generally she will stay quiet and stubbornly hang on to her attitude until her parents use a bulldozer to get her to wipe it away. The second girl has the Melancholy temperament. When confronted with something that upsets her or with something she didn’t do the right way, her perfectionistic spirit has to work it through with her mind which takes time away from others. Melancholies will usually find a place to hide until they work whatever is bothering them through. The girl in the third picture has the Choleric temperament. You can see attitude written all over her and she doesn’t care that you can. She is not happy and she makes sure you and everyone else knows it. The girl in the final picture has the Sanguine, happy go lucky temperament. When she isn’t happy however, especially if she has done something wrong, she will do something silly (in this picture she is pretending her parents can’t find her) to get her parents to laugh, hoping they will forget what she did. 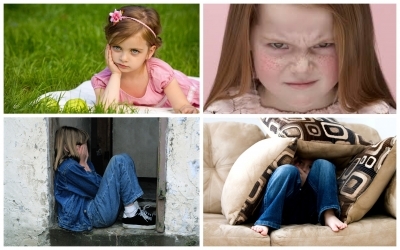 What temperament are each of your children most like? When your child has a wrong attitude he/she is NOT teachable, so what is the point of trying to get them to see your point of view? Instead of fighting with your child or trying to make him do something against his will, have him sit and do nothing including talk until he wants to apologize to you for his wrong attitude and agrees to have a good one for the privilege of joining the family again. For more teaching on this, check out the Mom’s Notes presentations of “It’s All About Attitude”, “Understanding Freedoms, Part 1” and “Understanding Freedoms, Part 2” (in CD/MP3 & Notes/PDF) and our book “Taming the Lecture Bug and Getting Your Kids to Think”. They can really help you deal with your child’s attitude. All are available in the www.ParentingMadePractical.combookstore.